I'm slowly but surely making progress on my medieval garb for this upcoming weekend. Oda was a huge help today in both fitting my sleeves (because I don't have four arms, thankfully) and helping me decipher my geometric pieces for the over gown. For once, I actually feel like I'm in a good place for finishing everything in a reasonable amount of time. 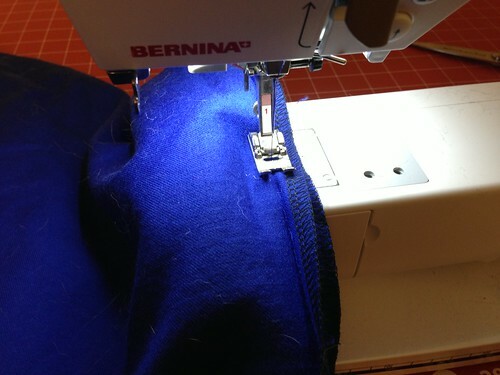 No hemming in the car! Remember that crazy expensive wool I bought? It's officially driving me insane because it has a front and a back to it but it's extremely subtle, to the point that I second guess myself every time I think I have the right side. I have always said that there is a sewing muse. And sometimes, if that muse is looking over my shoulder, I can accomplish great things. And other times, if the muse has wandered off, I make four left gores and no right gores. Jeremy had this tunic that we affectionately called the Great Black Tunic. I believe it was the first piece of garb that he made, with the help of Theo and Mel way back in Anno Societatis Dirt. It was made of black twill and had no particular period to it other than poofy and comfy. Jeremy loved this tunic. What you might not have noticed upon first glance, though, was that the tunic had pleats on the shoulder of one sleeve and pleats in the armpit of the other sleeve. He never fixed it and unless it was pointed out to you, it wasn't noticeable. There was an event ages ago that His Majesty Cuan was at and somehow managed to not have any garb. We loaned him the Great Black Tunic and at the end of the day (perhaps after a few beers) he espoused at length about how great that tunic was. The Great Black Tunic went home with Cuan. I'm doing a little fretting over my sewing right now. The muse has not left the building, but she seems to be spending a lot of time checking her Facebook versus looking over my shoulder. Oda commented too how she hates cutting other people's fabric because she dreads cutting it wrong. But we also geeked out about how the dresses they've dug up from bogs had some ... creative ... piecing as well. I figure that funky shaped gores are period. And I'm sure somewhere we'll dig up a tunic from a bog with pleats in the armpit (probably Spanish - those Spainards had wacky fashion sense).